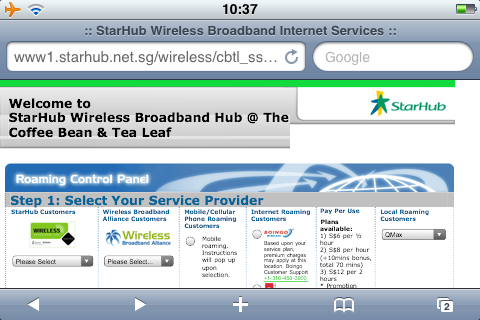 Little tip for those who use Qmax for their Wireless@SG provider, because you're not using SingTel or StarHub it means you can log into the free WiFi services at both Starbucks and the Coffee Bean (to use the places I frequent as examples) regardless of the carrier and use the "local roaming customers" option, very cool! One thing you have to keep in mind though is how you enter your username. On SingTel when you select Qmax the username field will be populated with @qmax.com.sg so you just have to enter your username at the beginning. On StarHub when you select Qmax they fill in the email address part but only after you've hit the [SUBMIT] button! In this case don't worry that you've only partially entered your details, when you enter your username and submit the form it'll still work. Now if I could get the Singapore Information and Development Authority to pay me for help posts like this we'd be in business. Newer post ← Think about the content, not the medium!